French researchers and clinicians have contributed greatly to the literature on this emerging imaging modality. The introduction of OCT angiography (OCTA) in France has generated great interest among retina researchers and clinicians. Most centers specializing in retina wasted no time purchasing OCTA devices, and French teams have published many articles on the topic. 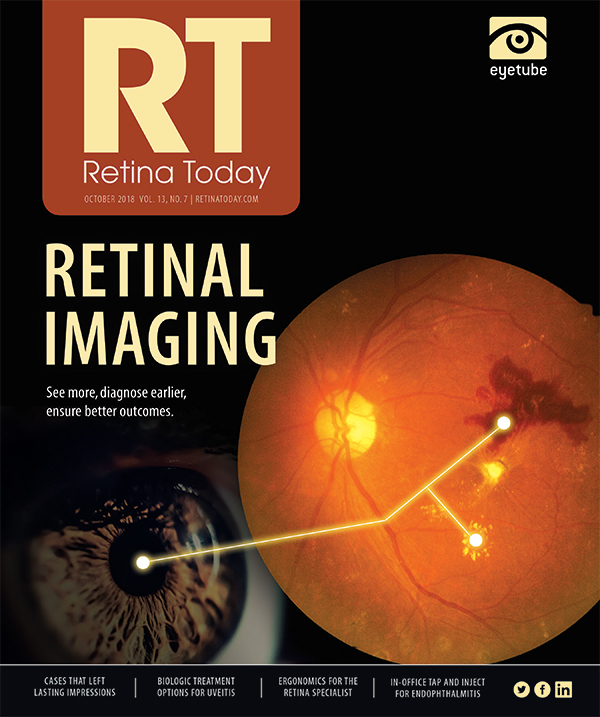 In this article, we describe the impact of OCTA on daily retina practice in France by reviewing a panorama of OCTA applications in different indications, summarizing key publications of French teams working with this technology, and presenting questions to several internationally recognized French experts in OCTA (see Ask the Experts). The advent of OCTA has changed our practice in the initial workup of patients with exudative age-related macular degeneration (AMD), resulting in a decrease in the number of fluorescein angiography (FA) and indocyanine green angiography (ICGA) examinations carried out (Figure 1). In our center, the figures speak for themselves. Performing an examination with dye injection used to be the rule in the initial assessment of choroidal neovascularization (CNV). Now, the indications for this type of examination have decreased by two-thirds. Figure 1. Patient with neovascular AMD in the left eye. Retinal photography shows the disappearance of the foveal reflex (A). Macular mapping shows retinal thickening in the area of the exudation: color presentation (B) and quantitative presentation (C). B-scan shows a bridge arch-shaped exudation above fibrosis (D). OCTA shows a CNV pattern (E). What is the potential for ultra-widefield OCTA in the near future? Jean-François Korobelnik, MD, University Hospital, Bordeaux, France: Large patterns of OCTA and automatic montage of several images are now available features on some units. Ultra-widefield OCTA provides information on the perfusion of the retina outside the arcades. This feature is helpful to evaluate the status of DR without injecting a dye. It is also helpful in retinal vein occlusion, as the clinician can evaluate both perfusion and the presence or absence or preretinal new vessels. It must be associated with color fundus photography to allow full evaluation of the retina. Does the availability of OCTA decrease the need for FA in AMD? Salomon Yves Cohen, MD, PhD, Université Paris-Est Créteil, Paris, France: There is a natural trend in the medical world to choose noninvasive over invasive examinations. OCTA is an important step in this direction. In exudative AMD, OCTA helps to image and confirm the diagnosis of CNV, but it is also a major tool in other diseases such as macular telangiectasia. In France, there is so far not enough evidence to support retreatment based on OCTA features, and the as-needed, or PRN, approach continues to be used, based only on signs of exudation as visualized on structural OCT.
What is the contribution of OCTA in the evaluation of posterior uveitis and other inflammatory diseases? Bahram Bodaghi, MD, PhD, FEBO, Pierre and Marie Curie University, Paris, France: OCTA has transformed our approach to posterior and panuveitis of various origins. Although more experience is needed, this noninvasive tool allows us to better evaluate the inflammatory and infectious lesions threatening visual function. Choroidal new vessels are probably the main target of this technology. Their activity under anti-VEGF and antiinflammatory treatment is better monitored, although certain criteria must be further explored in large series of patients. It must be emphasized, however, that OCTA is part of a global multimodal imaging strategy. How do you use OCTA in macular edema? What information does it provide in daily practice? Ramin Tadayoni, MD, PhD, Hôpital Lariboisière, Paris, France: OCTA is often part of my OCT image acquisition protocol as it is noninvasive and now fast. In macular edema, it gives me additional information that can be useful. Decorrelation signals in cystic spaces may be associated with slower improvement. A severely nonperfused macula warns us to be cautious about the visual prognosis and even more careful about the periphery. Widefield OCTA, which I request in selected cases, helps to evaluate peripheral nonperfusion, although it still must be validated in comparison with FA. Furthermore, comparison of structural OCT and OCTA imaging can help to differentiate active CNV from quiescent CNV and to choose appropriate therapeutic management: anti-VEGF injections in active CNV and simple monitoring for quiescent CNV. To date, we do not consider OCTA alone a sufficient tool to make a diagnosis of CNV recurrence. There is no consensus in the literature regarding activity features in the absence of neovascular exudation, and CNV growth is not a retreatment criterion for us. In pachychoroid associated with FIPED, Hage et al showed the utility of OCTA for identifying CNV.6 Although the possible occurrence of type 1 CNV complicating the course of chronic CSC should not be ignored, these authors said, all cases of FIPED should not be mistaken for active CNV and systematically treated with anti-VEGF therapy. OCTA appears to be useful for making this determination. Figure 2. Patient with DME in his right eye. 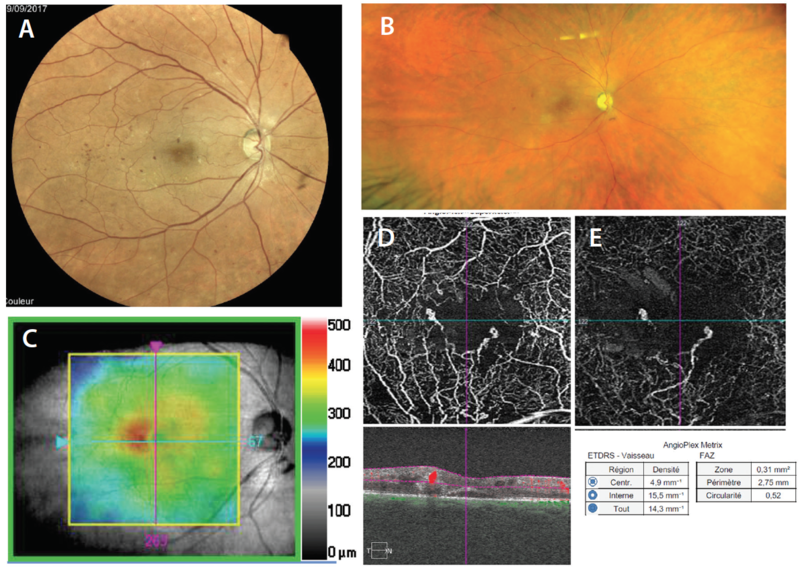 Sixty degree (A) and ultra-widefield (B) retinal photography showing nonproliferative DR. Colorimetric mapping showing retinal thickening corresponding to severe DME (C). Superficial vascular plexus showing enlargement of the FAZ and reduced vascular density; in the corresponding B-scan below, flow appears in red (D). DVC showing reduced vascular density; vascular density and FAZ parameters below in table (E). To date, however, these OCTA tools cannot replace the standardized methods recommended by ETDRS classification, especially because OCTA measurements do not provide specific thresholds for each stage of ETDRS classification. Improvements in this area by researchers and device manufacturers are therefore needed before clinicians will eventually be able to classify, diagnose, and monitor DR with OCTA without performing a fundus evaluation. OCTA can be used in vein occlusion to characterize macular changes induced by the occlusion. Glacet-Bernard et al showed a significant correlation between macular vascular density as quantified automatically on OCTA and peripheral nonperfusion seen on FA.11 Thus, OCTA could help to identify high-risk patients with retinal vein occlusion who might benefit from further evaluation with FA. Figure 3. Patient with familial retinal arteriolar tortuosity. Superficial vascular plexus (A). B-scan showing segmentation of OCTA in A with blood flow in red (B). DVC (C). B-scan showing the segmentation of OCTA in C with blood flow in red (D). The deep retinal FAZ seems to be enlarged in eyes with noninfectious posterior uveitis, both in the presence and the absence of macular edema. Progress is still needed with OCTA software and hardware to reduce the frequency of artifacts, improve the acquisition process, enlarge exploration fields, and standardize procedures so that they will be less dependent on technicians. Nevertheless, despite its limitations, OCTA is now a valuable tool in the multimodal assessment of retinal diseases. The experience of French researchers and clinicians at multiple centers, as outlined above, has contributed to the body of knowledge on this relatively new imaging modality, and we see no reason why these contributions will not continue as OCTA is integrated into routine clinical retina care. 1. Mrejen S, Giocanti-Auregan A, Tabary S, Cohen SY. Sensitivity of 840-nm spectral domain optical coherence tomography angiography in detecting type 1 neovascularization according to the height of the associated pigment epithelial detachment [published online ahead of print July 13, 2018]. Retina. 2. El Ameen A, Cohen SY, Semoun O, et al. Type 2 neovascularization secondary to age-related macular degeneration imaged by optical coherence tomography angiography. Retina. 2015;35(11):2212-2218. 3. Miere A, Querques G, Semoun O, El Ameen A, Capuano V, Souied EH. Optical coherence tomography angiography in early type 3 neovascularization. Retina. 2015;35(11):2236-2241. 4. Cohen SY, Miere A, Nghiem-Buffet S, Fajnkuchen F, Souied EH, Mrejen S. Clinical applications of optical coherence tomography angiography: What we have learnt in the first 3 years. Eur J Ophthalmol. 2018:1120672117753704. 5. 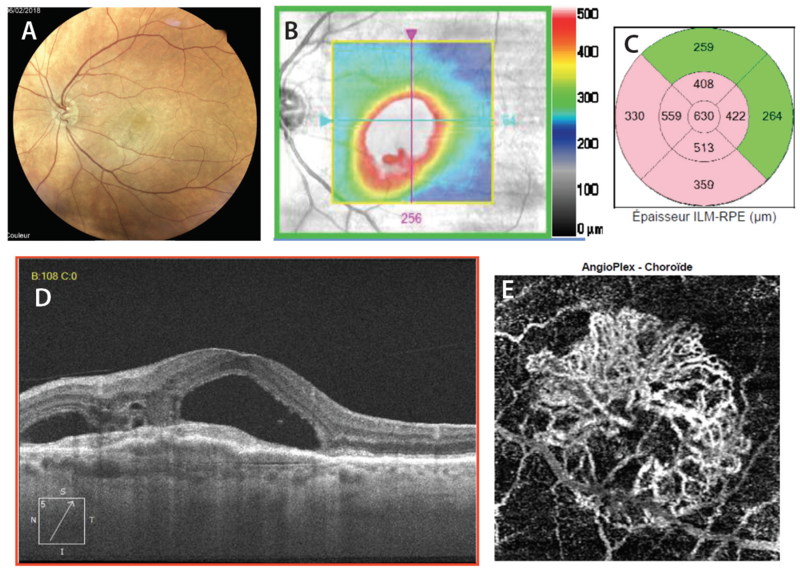 Bousquet E, Bonnin S, Mrejen S, Krivosic V, Tadayoni R, Gaudric A. Optical coherence tomography angiography of flat irregular pigment epithelium detachment in chronic central serous chorioretinopathy. Retina. 2018;38(3):629-638. 6. Hage R, Mrejen S, Krivosic V, Quentel G, Tadayoni R, Gaudric A. Flat irregular retinal pigment epithelium detachments in chronic central serous chorioretinopathy and choroidal neovascularization. Am J Ophthalmol. 2015;159(5):890-903.e3. 7. Dansingani KK, Tan ACS, Gilani F, et al. Subretinal hyperreflective material imaged with optical coherence tomography angiography. Am J Ophthalmol. 2016;169:235-248. 8. Giocanti-Aurégan A, Sarda V, Nghiem-Buffet S, Fajnkuchen F. [Prepapillary neovascularization in florid diabetic retinopathy]. J Fr Ophtalmol. 2016;39(6):581-582. 9. Pedinielli A, Bonnin S, Sanharawi ME, et al. Three different optical coherence tomography angiography measurement methods for assessing capillary density changes in diabetic retinopathy. Ophthalmic Surg Lasers Imaging Retina. 2017;48(5):378-384. 10. Couturier A, Mané V, Bonnin S, et al. 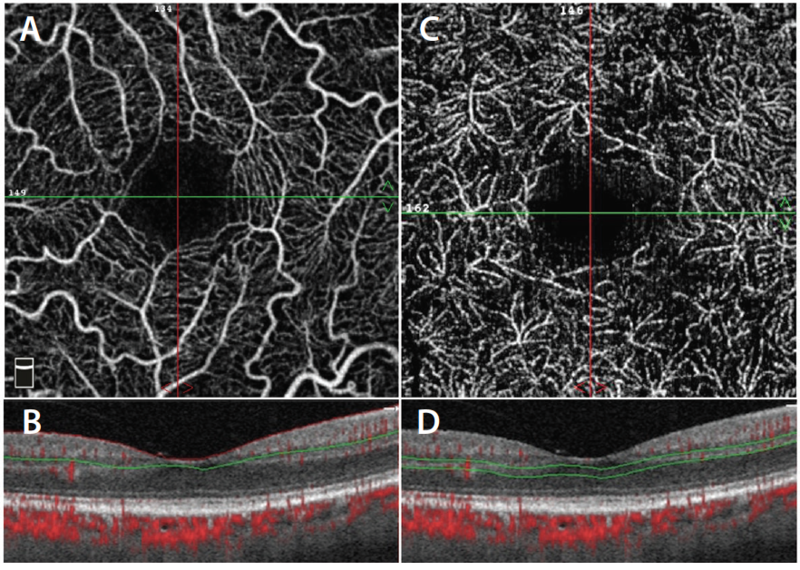 Capillary plexus anomalies in diabetic retinopathy on optical coherence tomography angiography. Retina. 2015;35(11):2384-2391. 11. Seknazi D, Coscas F, Sellam A, et al. Optical coherence tomography angiography in retinal vein occlusion: correlations between macular vascular density, visual acuity, and peripheral nonperfusion area on fluorescein angiography. Retina. 2018;38(8):1562-1570. 12. Onishi AC, Nesper PL, Roberts PK, et al. Importance of considering the middle capillary plexus on OCT angiography in diabetic retinopathy. Invest Ophthalmol Vis Sci. 2018;59(5):2167-2176. 13. Gozlan J, Ingrand P, Lichtwitz O, et al. Retinal microvascular alterations related to diabetes assessed by optical coherence tomography angiography: a cross-sectional analysis. Medicine (Baltimore). 2017;96(15):e6427. 14. Dupas B, Minvielle W, Bonnin S, et al. Association between vessel density and visual acuity in patients with diabetic retinopathy and poorly controlled type 1 diabetes. JAMA Ophthalmol. 2018;136(7):721-728. 15. Gaudric A, Krivosic V, Tadayoni R. Outer retina capillary invasion and ellipsoid zone loss in macular telangiectasia type 2 imaged by optical coherence tomography angiography. Retina. 2015;35(11):2300-2306. 16. Dansingani KK, Inoue M, Engelbert M, Freund KB. Optical coherence tomographic angiography shows reduced deep capillary flow in paracentral acute middle maculopathy. Eye (Lond). 2015;29(12):1620-1624. 17. Giocanti-Auregan A, Gaudric A, Buffon F, et al. Optical coherence tomography angiography of familial retinal arteriolar tortuosity. Ophthalmic Surg Lasers Imaging Retina. 2018;49(6):397-401. 18. Astroz P, Miere A, Mrejen S, et al. Optical coherence tomography angiography to distinguish choroidal neovascularization from macular inflammatory lesions in multifocal choroiditis. Retina. 2018;38(2):299-309.